Vice Lord-Lieutenant of the Isle of Wight (2006-present). Appointed a Deputy Lieutenant for the Isle of Wight in May 2002. 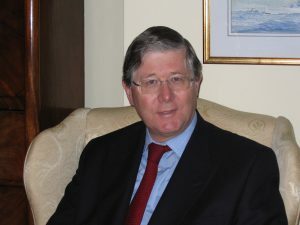 Born in 1946, he was educated in Sussex and Devon and at the Royal Military Academy Sandhurst, and for the next 28 years followed a progressive career in the Army in the Royal Artillery throughout the Cold War, serving in Germany, Hong Kong and the United Kingdom, retiring in the rank of Lieutenant Colonel in 1994. As a serving Major he was appointed Equerry to HRH The Duke of Edinburgh (1988-1990), and on retiring from the Army he was appointed Deputy Master of HM The Queen’s Household (1994-1999), and is an Extra Equerry to HM The Queen (1999-present). From 2000-2005 he administered the charitable arm of HSA (now called Simply Health), a national healthcare mutual insurance company based in Andover. He is married with two grown-up sons and two granddaughters. He and his wife Chrissie have lived in Totland since 1996. She is the Principal of the West Wight Ballet School. He is currently President of Isle of Wight Scouting; Chairman of the Isle of Wight fundraising committee of ABF The Soldiers’ Charity; a PCC member and a member of the Isle of Wight Deanery Synod. His interests include sailing (he has raced and cruised extensively in the Baltic, English Channel and the Solent in regimental and friends’ boats – he is not an owner); gardening; country pursuits; music. On the death of his father in 1983 he succeeded as 6th Baronet Acland of St Mary Magdalene, Oxford. He moved to the Isle of Wight with his parents and siblings as a twelve-year-old, spent the remainder of his childhood very happily here, eventually married the girl next door, and in spite of his globetrotting careers he and Chrissie have always considered the Island to be home, which is why they bought their own house in the West Wight on leaving the Army.